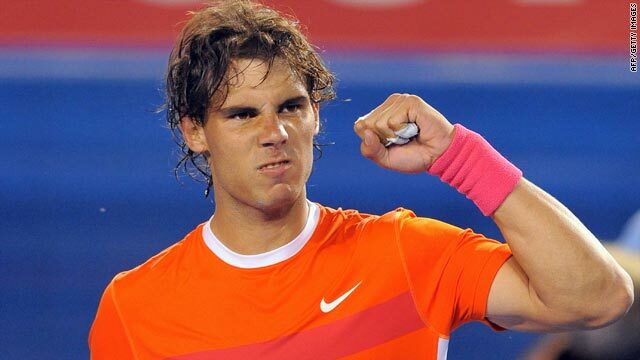 Rafael Nadal will face Andy Murray in the quarterfinals if both win their fourth-round matches in Melbourne. (CNN) -- Defending champion Rafael Nadal battled through into the last 16 of the Australian Open after being taken to four sets on Friday, while fellow title hopefuls Juan Martin Del Potro, Andy Murray and Andy Roddick also progressed. World No. 2 Nadal progressed after beating German 27th seed Philipp Kohlschreiber 6-4 6-2 2-6 7-5 in three hours and 39 minutes. "I have broken serve a lot so far this tournament against guys that have good serves," Murray said. "Kevin Anderson is a good server. I returned well against him. I'm going to need that in the next match. If Argentine Del Potro wins that match, he will play either seventh seed Andy Roddick or 11th seed Fernando Gonzalez in the quarterfinals. Both men recorded 29 aces, but Lopez suffered through 60 unforced errors, while Roddick had 21. "I felt like I was real close to getting on top of the match and making it, turning it, to kind of make it a little bit more comfortable," the American told the tournament's Web site. "Just didn't quite get there."